Henry (Harry) Cobain was the son of Joseph and Sarah Cobain, of Dunnisk, Pomeroy, County Tyrone. He was working in the North of England when he enlisted at Chopwell, County Durham, joining the Durham Light Infantry and subsequently transferred to the 6th Battalion East Kent Regiment (The Buffs). On the 27th August 1918 the 6th East Kent’s were given the objective of taking the east edge of Trones Wood, east of the town of Albert. 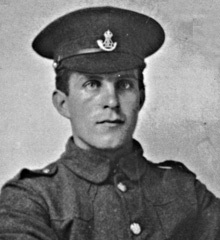 Captain L. P. Figgis and 10 men were killed in the action, including Henry Cobain. 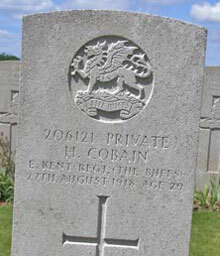 He is buried in grave 4-C-27 at Peronne Road Cemetery, Maricourt, France.